Who says smartphones can’t have viewfinders and physical controls? The Miggo Pictar Pro gives iPhone and Android phones a viewfinder and DSLR-like control wheels along with an extra battery. Even more impressive, the phone grip, like the original Pictar (see our full review), does it all without a wired or Wi-Fi connection with the phone. The Pictar Pro is a photography-focused phone grip that’s designed to give smartphone photographers as many DSLR-like controls as possible. Like the original Pictar unveiled 2016, the Pictar Pro has a larger grip, control dials, and a shutter button to trigger photos. But the latest grip takes that even further by adding several new features, including a zoom toggle that works for photos and videos. One wheel controls exposure compensation to lighten or darken the image, while the second smart wheel selects the shooting modes that are available inside the Pictar app. The modes include auto, shutter priority, ISO priority, manual, macro, video, selfie, sport, and filters. The wheel also doubles as a button — pressing the wheel will scroll through the different flash buttons. Users can also change the function of the button using the app. But perhaps even more interesting is the Pictar Pro’s optional viewfinder accessory. The viewfinder attaches via a dedicated slot and sits over the top of the phone’s screen, and then the screen is resized to fit the viewfinder. The viewfinder, with an optical plastic lens, blocks out the sunlight that can cause screen glare, making it viewable even under bright conditions. When not in use, it collapses into itself for storage. Miggo also showed us the viewfinder, however, it was a non-working unit; Miggo claims the production version will work. The grip also houses an extra battery that provides additional power to phones that support Qi wireless charging. A cold shoe connection at the top of the camera holds accessories, like a video light or microphone. And because the lens area of the phone is exposed, you can attach add-on lenses without the grip blocking the way. Like the original Pictar, the Pictar Pro doesn’t connect to the phone using Bluetooth or hard connection. Instead, it communicates using sound. Each control you make, sends out a different sound that the app recognizes. When the app recognizes the sound, it changes that particular setting. When we reviewed the original Pictar, we thought the case performed surprisingly well using those sounds to adjust settings, without a noticeable lag. The sounds are so high pitched, they aren’t audible to humans, Miggo says. Besides the physical controls, extra battery, and viewfinder, the shape of the Pictar Pro gives smartphone photographers a more comfortable grip. 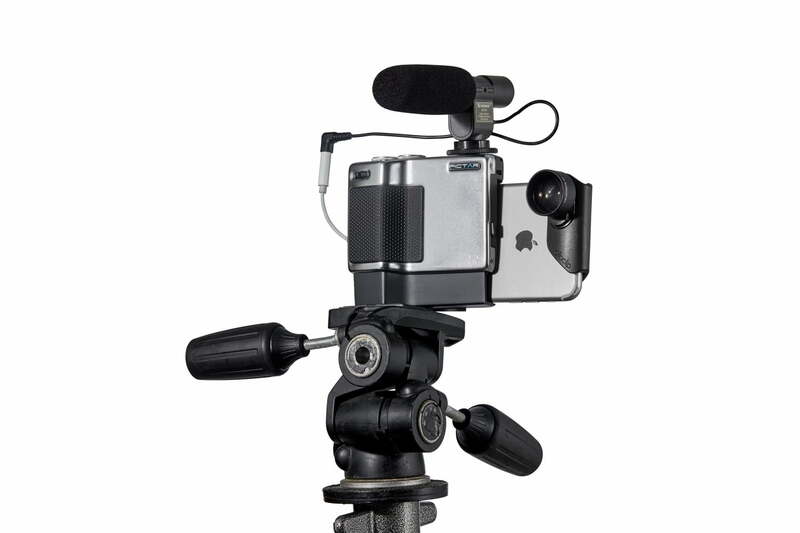 The grip also has a tripod mount screw at the bottom. Like the original Pictar, the new version is inspired by historic cameras, but this time, from ’70s and ’80s designs using a satin-finish brass construction. The grip also includes a neck and wrist strap. Digital Trends had an opportunity to see a sample of the Pictar Pro. It has a much more solid and robust metallic build quality than the original plastic Pictar, and is a tad heavier to provide a nice weight balance when shooting. The textured “shark skin” grip is also more substantial, and a spring-loaded mechanism lets it accommodate the largest of smartphones, whether it be iOS or Android. The Pictar Pro comes with a wrist strap and a neck strap, both made from parachute cord and leather. Miggo is taking to Kickstarter to fund the project, with awards that include the Pictar Pro starting at $ 119. After the campaign, Miggo estimates delivery sometime toward the beginning of 2019. While the original Pictar was designed for iPhones, the Pictar Pro, as mentioned, is compatible with a long list of iPhone and Android models, with the full list of compatible models on the Kickstarter page.